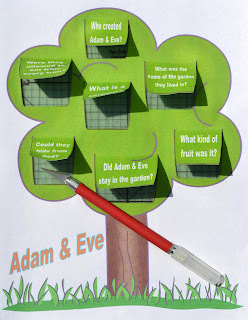 Today's Bible lesson is Adam & Eve. I wanted to spend time reviewing last week's lesson on God's Creation. I made the project for today so I could combine both! I put together the Lift-the-Flap, and there are options for these printables! We added stickers of things that God created like the sun, flowers, bees, butterflies, ladybugs, etc. The kids love stickers! And, it made it more fun for them! Review: Last week we talked about creation. The very first verse in the Bible is ‘In the beginning God created the heavens and the earth.’ We talked about what God made each day. On the 6th day He made Adam. God made the animals and Adam named them. God made woman, Eve, from Adam’s rib. Lesson found in Genesis 2 & 3: When God gave the woman to Adam, Adam said because she was formed from my flesh, she will be called woman. They were married and they were both naked in the garden, but they were not ashamed of it. Remember, there wasn’t sin yet, so they were not embarrassed to be naked. There was a serpent in the garden. What is that? A snake. 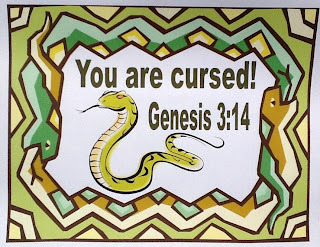 The Bible says the serpent was more cunning (or sly) than any animal that God had made. 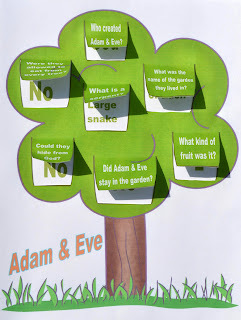 He asked Eve if it was true that God told them they couldn’t eat of every tree in the garden. 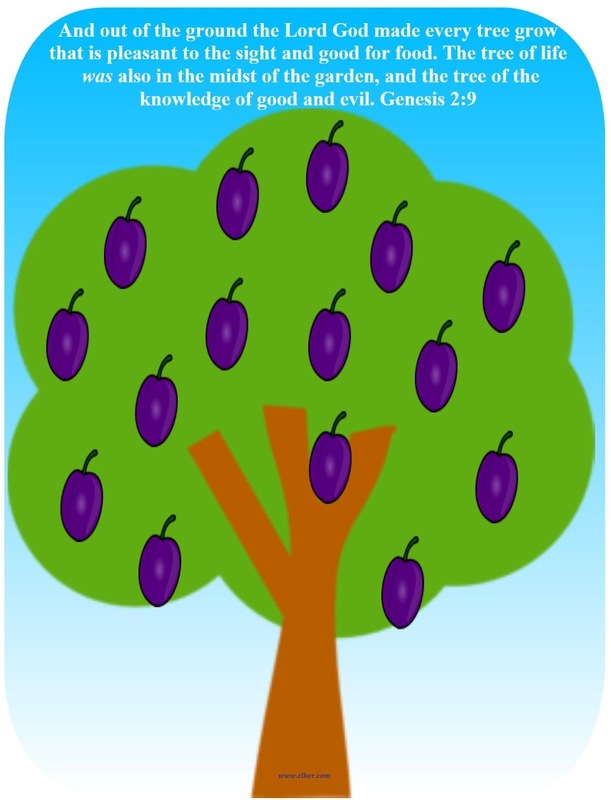 Eve told the serpent that they could eat the fruit from every tree except for one and if they eat from it or touch it, they would surely die. Then the serpent told Eve that you are not going to die! Because God knows that when you eat from it, your eyes will be opened and you will be like God, knowing good from evil. 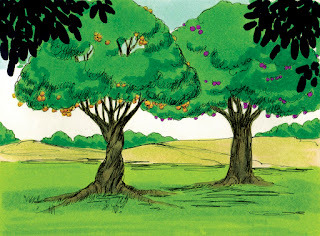 (vs. 5) When Eve saw the tree was good for food and it looked good to her eyes, and now she thinks that it will make her wise, she took the fruit and ate. By the way, the Bible states fruit, it does not tell us what exactly kind it was. 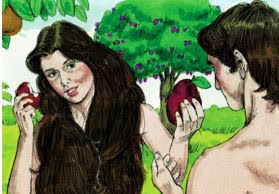 Then, after Eve ate the fruit, she gave it Adam and he ate it also! 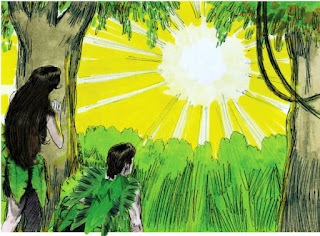 Eve disobeyed God, then Adam did too! Then, their eyes were opened and they knew they were naked. 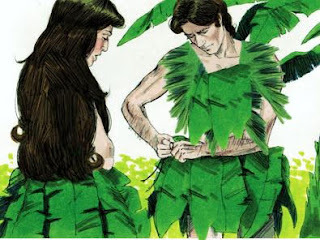 They sewed fig leaves together to cover themselves. 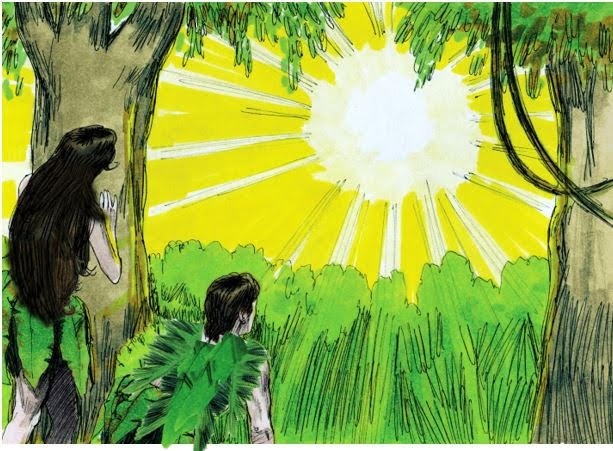 While God was in the garden, Adam and Eve were hiding in the trees. Really, can you hide from God? 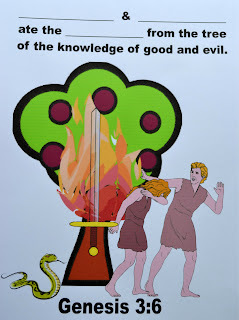 Adam told God that “The woman You gave to me fed me from the tree and so I ate.” God asked Eve “What have you done?” And she said “The serpent lied to me and I ate.” So, everyone is trying to blame someone else! 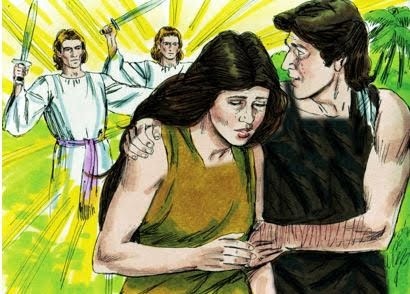 And then to Adam, He said “Because you listened to your wife and did what I told you not to, you will have to work hard to make a living.” Instead of God taking care of them, man would have to farm the ground to eat and now there will be thorns and thistles to make it harder and you will sweat to eat. (Verse 20) And Adam called his wife Eve because she was the mother of all living. God made tunics from skin to clothe them now that they know good from evil. God sent them from the Garden of Eden and He put cherubim at the east of the garden. 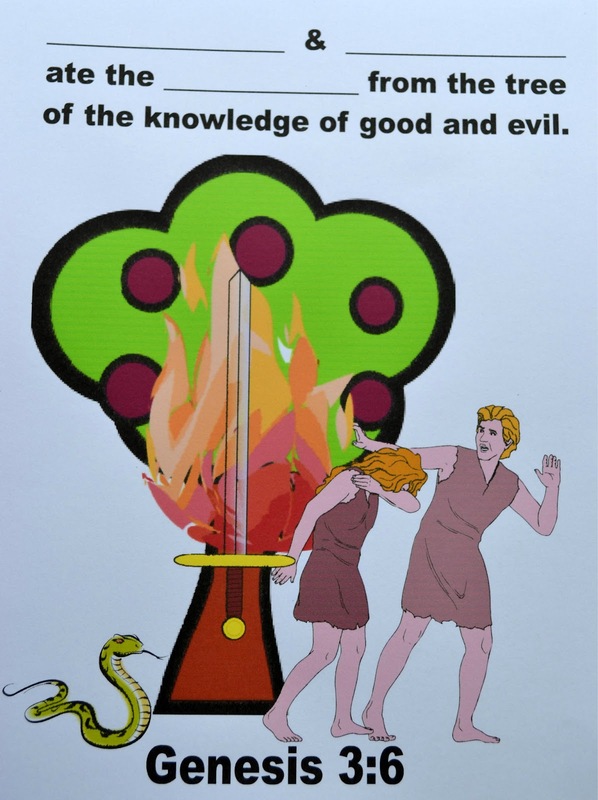 God also put a flaming sword that turned every way to guard the way to the tree of life. Today's project is a Lift-the-Flap with review questions on the top and answers they should know on the bottom. 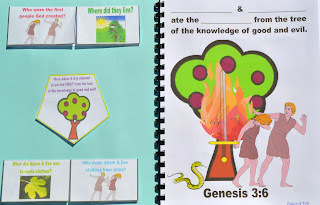 I wanted to spend time reviewing creation, so we will answer these questions, then the kids will add God's creation stickers on this to finish it. Keep in mind, you can use a blank sheet of cardstock/paper for the bottom if you want your kids to write the answers themselves. All the Genesis Worksheets can be printed here. Here is a full page size Bible verse page to print. This is a great resource, I think it will come in VERY handy when my kids are going through Creation in a few weeks! Thank you so much! Thank you! Thanks for the really nice comment! I appreciate you visiting! Thanks so much for visiting! Thanks for hosting & I will see you at the party! Sidewalk Chalk sounds like fun! Thank you Audrey! I am glad you can use it! I appreciate you stopping by! I would really love to print the Adam and Eve story picture cards but cant figure out how. Is there a link? I have been searching for this type of resource for a long time. Thank you for putting this together. I will be sharing your site and blog with all of my home schooling friends. God bless you and your family!